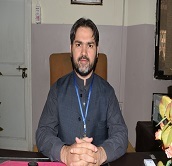 DR SAJJAD ALI, is Head Of ICU Department in Mardan Medical Complex, Mardan. A-P Pulmonology working as Incharge of G.ICU for 1.5 years. Chest Specialist and intensivist with special skill, and interest in writing medical research papers.